CuteDJ joins the lexicon of available DJ mixing software, promising industry-standard power for all with impressive support for your music, video and equipment. Don’t be fooled by CuteDJ – the name alone has the capacity to mislead. This is by no means cuddly, meek or fluffy DJ mixing software. In fact when you first clap eyes on the default interface you will immediately appreciate the array of tools at your mercy. With so many DJ software apps for desktop, tablet and mobile following the fashionable Fisher Price school of UI, CuteDJ certainly appears more grown up. If slightly overwhelming for the uninitiated, the workspace shows a top half panel tightly packed with buttons, faders and cue controls. Below is the file explorer providing quick, simple access to your stored assets via the familiar list view. Search and navigation options are helpful here but the application really comes into its own when allowed to crawl through your iTunes library. Seamless integration with Apple’s media manager is essential for leveraging the existing awareness you’ll doubtlessly have for your stored audio, especially if you just want CuteDJ to rock your own house party. What’s more, the app will automatically mix any iTunes playlist admirably – leaving you free to focus on doing your best Calvin Harris impression. This breadth of mixing options is actually where CuteDJ is so good for novices and experts alike. Within a matter of minutes newbies will have two tracks loaded and cued, twiddling the BPM manually or hitting ‘sync’ to faultlessly match tempo.The results are so immediately great that it’s a joy to begin experimenting and gleefully deciphering what each button does. From a probable state of initial bafflement its amazing how intuitive and organic CuteDJ feels once the sounds are spinning. Quick halting, breaks, reverse, adjusting pitch, Gain, EQ and of course scratching are fundamentals that don’t disappoint. As you progress you can cut and drop in a bank of saved loops, as well as applying the kind of plugins most GarageBand and Logic Pro X fans will know all too well. CuteDJ supports popular VST effects and AudioUnits so there’s real extensibility for creative sonic output. Perhaps however this is where any GarageBand-type parallels don’t go quite far enough. CuteDJ could add certain assets, tooltips, and tutorials etc like Mac’s music-maker for aiding the learning curve without ‘dumbing down’ on power. For an application with so much to offer those at each end of the user spectrum it seems a shame it doesn’t do more to bridge that middle ground in between. Thankfully though, like any DAW software worth its salt, CuteDJ pulls fewer punches when supporting file types and hardware. Out of the box this is a classic DJ setup with twin record decks and virtual mixer, but adding interfaces and gear is so straightforward. An impressive 50+ hardware controllers from iconic manufacturers such as Denon, Numark, Gemini, Pioneer, Akai and Vestax are instantly detected and pre-mapped in a heartbeat. In fact all native and non-native MIDI controllers are usable with CuteDJ’s LEARN facility for assigning controls. This really strengthens the software’s hand in the live “on the fly” mixing stakes, which is what it’s all about at the higher level. CuteDJ then carries this same approach to support into the recognition of 15 file formats beyond MP3 – including video! That’s right, you can apply those mixing skills, effects and transitions to video sequences and potentially propel those live performances to greater heights. Throw in the thoughtful support of Karaoke CDG files and analog input for microphone, and you’ve everything for a Rockband-style sing-a-long! If these seem like gimmicks tacked on for some, for others they could genuinely transform CuteDJ into a rather different proposition and provide a unique selling point over rival suites. 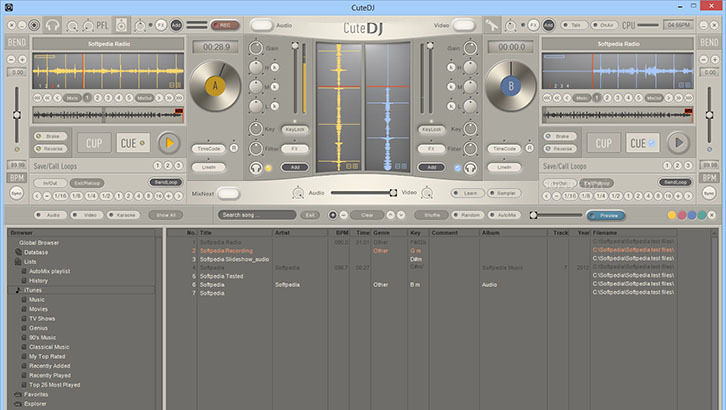 Overall CuteDJ is a serious piece of DJ mixing software. Delve beyond a functional, perhaps dated interface and the feature depth is highly rewarding. An expected emphasis on live mixing is backed up by excellent hardware and file support, with a capacity for adding limitless audio effects. Automated beat- matching and playlist mixing gives novices a way in, while more experienced DJ’s will unlock the application’s true power. The price however, $129.95 USD (£77.55 UK) for both Windows and Mac, may dictate how much you can justify purchase against cheaper equivalents. Frankly though if you do crave a more comprehensive, standalone solution that will grow as your mixing skills develop it would be foolish to stray too far from CuteDJ.